A tall plant with large purple blooms found in the swamps of Hjaalmarch. Best known for the use of creating poisons. Domica Redwort is a herb grown for their beautiful and showy flowers. They attain a height of about three feet and have feathery leaves; the flowers are usually bright red. In addition to their beauty, they are said to have magical abilities to enhance the appearance of anyone who carries or wears one of the flowers. 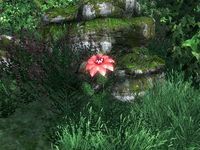 Commonly grown in Valenwood, wild Redwort may also be found in Cyrodiil, where it grows primarily in the West Weald, with sparse occurrences in the Blackwood region and along the Panther River. Attempts were made in the Second Era to transplant it in the Summerset Isles. A shrub with black branches used for decoration in the gardens of the Blue Palace in Solitude. 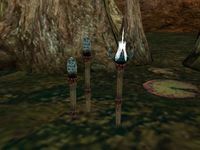 The primitive Draggle Tail reeds are found in the swamps of the Bitter Coast region of Vvardenfell. The immature state of the plant's fruiting body are called ampoule pods, which bloom into the luminescent coda flower. Draggle Tails are prized by alchemists for their modest magical properties. Dragon Scale Mushrooms are exotic mushrooms found in Deshaan that are known for their magical essence. When combined with Kyne's Heart Healing Herbs and Sour Milk Tea, this fungus can be used to create a cure for the infamous Llodos Plague, which ravaged Deshaan during the Interregnum. They can be found in The Tedas House in Quarantine Serk, in a potted plant immediately to the right when you enter the door. Dragon's-Tongue is the common name for a fern like herb found prolifically around the Utherus Swamp of Black Marsh. It flowers with a golden head, protected by fire-red frond. 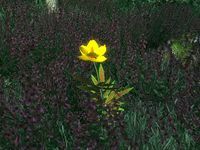 Dragon's Tongue plants can also be found in Skyrim and in Cyrodiil's West Weald and along the Panther River. 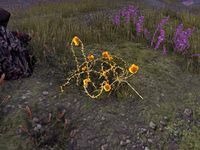 Dragonthorn is a fairly small thorny bush with bright yellow flowers sprouting across its long tangled stem that can be found growing across Tamriel. The Bright-Throat Tribe of Murkmire once believed that chewing Dragonthorn leaves helps the body prepare healthy eggs during bonding season. 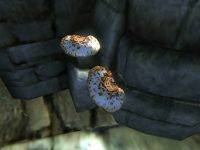 The Dryad's Saddle Polypore is a white, brown mottled shelf mushroom that is found in only a few select locations throughout Cyrodiil. A kind of flower found in Hoarfrost Downs in Rivenspire. They can be found most notably near an old tower north of the settlement. Some people are allergic to these flowers. This page was last modified on 8 January 2019, at 19:45.